Are you fed up of looking at your body and wishing it was tighter and more toned? No matter how hard to train you can’t seem to shift that cellulite you hate so much! Well now you can! The Lanaform cellulite massager has been designed to banish that stubborn fat and orange peel skin, all from the comfort of your own home. The Stop Cell from Lanaform is the perfect device for cellulite treatment if you want to look and feel your best. This handheld, multifunctional cellulite massager not only helps you prevent unsightly fatty deposits, it also helps to reduce that unpleasant orange peel look. The massaging effect also helps to improve your blood circulation and soften your skin. Stop Cell can also be used as a full body massage system for a great pamper session! The device is rechargeable so you can enjoy unrestricted movement and won’t get caught up in frustrating wires. Easy and comfortable to hold, you can use your Stop Cell every day to prevent fat deposits and reduce the “orange peel effect” on your skin. For the best results, we recommend you use your Stop Cell regularly; 5 minutes each day on each individual area to be treated for a total of 20 minutes per session. Please note that the massage movement should always be carried out towards the heart. The massaging motions will stimulate circulation deep under your skin and break down the cellulite bit by bit. To get the best results, combine this treatment with a balanced diet and physical exercise. 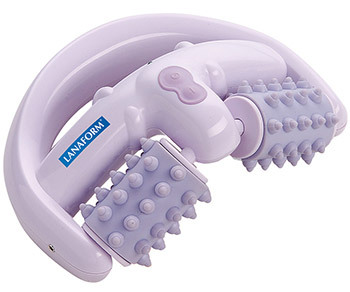 Set upon your journey to get the body of your dreams today with the Lanaform Stop Cell Vibrating Massager. Always unplug the adapter prior to cleaning the device. Never use liquids or abrasive cleaners to clean the device. Simply wipe with a damp cloth.